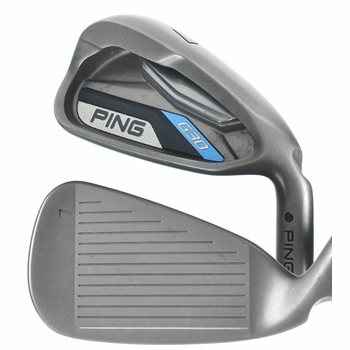 The Ping G30 iron set offers progressive lengths and lofts and a thin face that will help you launch the ball high yet significantly farther, while still providing the added control you need to consistently attack the flag. Faster ball speeds are provided by a Custom Tuning Port that sits very low and supports a thin face. The low-back center of gravity optimizes launch and forgiveness while ensuring a solid feel. Slightly longer heads also boost the moment of inertia, and a new sole design ensures solid contact. Review by Dennis Gregory, 2 years ago. Review by RDE, 3 months ago. Please refer to the information to the right of the picture for more information. Depending on availability and options the number of clubs might vary. Provide Ping serial numberss for set to assure authentic Ping product. Please send me the Ping Serial Number for this set of clubs so I can verify their authenticity. Have purchased clubs before and found them to be knock offs. Thank you. What size/brand/type grips are on these clubs? Unfortunately, due to the size of our inventory and multiple shipping locations, we are unable to verify grips on a specific set. All grips will be in a playable condition.